Ernie Els believes that Tiger Woods is not out of the running for his 15th major victory at Pebble Beach. The world No 1 shot a 72 to trail Graeme McDowell by seven shots on four over par but “Big Easy” Els, who hit a brilliant 68 to share second place in the clubhouse on one under, is not counting the big cat out of the equation. “You can’t rule him out,” Els said. “A guy that’s won 14 Majors he’s got a lot of game. I think he’s very close. I haven’t played with him in about a year. I think his ball-striking was pretty good the last two days. His short game is pretty sharp, he just didn’t make enough putts. As for his own chances he said: “Well, it’s been such a long time since I won one of these. But we’ve got a long way to go. Els won the US Open in 1994 and 1997 and while it’s been eight years since his last major win, the 2002 Open at Murifield, he’s playing well enough to win his fourth major this week. Lee Westwood certainly believes he can end Europe’s 40 year wait for a US Open win after he carded a level par 71 to sit six shots behind McDowell on three over par. Starting on the back nine, Westwood bogeyed the par five 14th and 18th holes but still turned in level par and then followed a bogey at the first with a birdie at the par-five sixth to remain within striking distance of his former stable mate. He added: “I didn’t get any momentum going either day but to be three over going into the weekend isn’t a bad position. “You can’t attack a US Open course, you have to play patient golf and once you’ve done that you know you just have to hang around and not be too aggressive. “I feel I can hang about for the next 36 holes and perhaps on Sunday afternoon have a chance. I don’t anybody’s going to run away with this. Woods endured another frustrating day on the greens as he posted a one over par 72 to sit seven strokes off the lead on four over par. The world No 1 chipped in for his first birdie of the week at the par four 11th but still remained on three over through the turn after a birdie at the 14th was cancelled out by bogeys at the short 12th and 17th. Back to back bogeys at the second and third did little to brighten his mood before he made a birdie two at the spectacular par three seventh. He’s an idol for millions of young golfers, including 18 year old Ishikawa, who is just two shots off the pace after a 71. And Els believes the Japanese superstar has the confidence to stick around for the weekend and challenge for the title. Els said: “He’s extraordinary. He’s only 18 years old. He played in The Presidents Cup last year, and I really got to know him well there. He’s a great kid. “It’s amazing that he’s only 18. He already shot 58 this year. Just think about it, shooting 58 in the Tour over there in Japan at 18, it’s phenomenal. 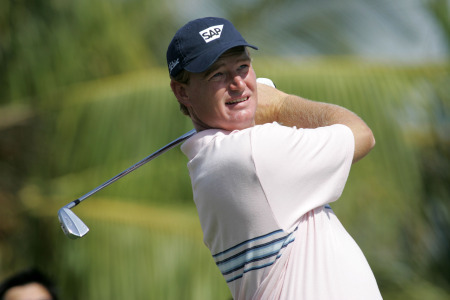 Ernie Els — "People were looking at me like I didn’t have any pants on"
Those of a cruel disposition call him the Big Difficult but anyone whose dealt with Ernie Els will attest to his status as the gentle giant of the game. McDowell fears for Tiger: "His mental health is one question and his physical health is now another"
Tiger Woods on the run, a sight that hasn’t been seen since April. Picture Fran Caffrey/www.golffile.ie.US Open champion Graeme McDowell fears for Tiger Woods’ future in the game. The 14-time major winner pulled out of next week’s major test at Congressional citing lingering left knee and Achilles’ tendon problems and McDowell is among those wondering if he will ever be the same again. Ernie Els speaks to the media at Merion on Monday. Picture via @GAofPhillyNearly five years have passed since Pádraig Harrington captured his third major title.